RBF had a pretty big bunch head off to Chatt Hills a couple weekends ago. 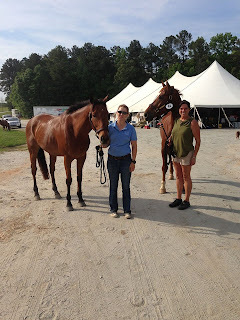 Jessie has Elliot and Heidi, owned and bred by Meredith Michelfelder with Midway Farms, in the CIC2 and CIC1 respectively, Reagan Bugg had Heath in the beginner novice, Sarah Sage had Warren in the novice, and Megill Imes had Ollie in the Training. We were pretty much covering the whole gambett. Betsy did not bring any one in the end so that she could help everyone else. Elliot was pretty good after his little accident with the three board fence earlier the week before the event so we made the deicision to bring him. He was plenty fit and so the biggest problem would be dressage. That we could live with! Elliot and Heidi both passed the initial jog on Thursday evening and hacked well. They are getting to be quite the competition horses. Heidi, who is only 6, is especially remarkable. She's only been with RBF 6 months and she's professional and polite inaddition to be phenomenally athletic! 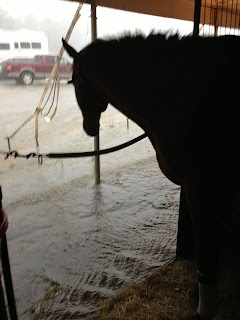 The FEI horses had Dressage Friday morning and then had to jump under the spot lights Friday evening. Both horses put in solid tests. Heidi had moments or greatness for her first time in a standard arena. Jessie couldn't help but wear a shad belly for Heidi's big international premier! Elliot muddled through. The week of little riding and being able to stretch his legs definitely effected his performance. He was not elastic and soft like a couple weekends before at Poplar Place, but he did all the movements (mostly) and even pulled out a qualifying score! Show jump was going to be an experience. They decided to do it late in the day to allow spectators to come watch. Heidi went early enough that it was still light out. She was spectacular. Even when Jessie got her in DEAD wrong at the triple and she had to put a two in the one and a three in the two, she found her way out and left all the rails up. What a different horse from the mare that didn't mind playing pick up sticks a few months ago! Elliot was not as lucky as Heidi in the order of go. He show jumped at 9pm and it was dark. They had never jumped under lights before AND he hadn't been jumped since Poplar Place over two weeks before. We were all ecstatic with two rails! He's a horse with a lot to give. We were also very happy not to be in the CIC3 since they ran until midnight or something absurd! Elliot's go was late enough for us old ladies. 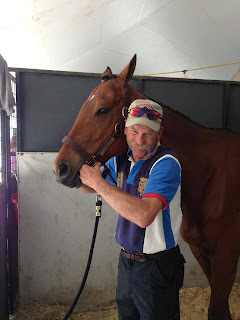 We ere lucky to get a hold of Dougie Hannum, who worked his magic on Elliot some before SJ and XC. It help some of the crookedness issues especially for XC on Sunday AM. Heidi ran XC first. After a good dressage test and double clear SJ round she was in 12th. A clean XC round was sure to move her up even further. How exciting for her first international event! And she did not disappoint. She was a little squirrely out of the box, but by fence three she was on target. With only two seconds over the clock was good enough for 6th place. Sixth place for the six year old! Was an amazing, exciting horse. Elliot was also phenomenal. People were walking home left right and center off a proper 2* course. There were big tables, skinny skinnies, and some very impressive corners. They ran slow on purpose, but came home without jump faults and a great deal more education. The next time, they will be very competitive. Elliot has really come into his own. 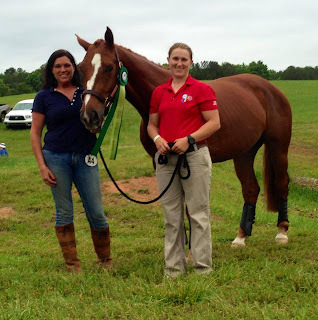 He has a lot of talent, but even more important for an event horse he's got a lot of heart. He wants it. As if the rides weren't good enough, Elliot and Heidi also got shout outs and pictures on Eventing Nation's recap of their levels. They are both very special horses and both deserve some recognition! Heidi and Elliot were not the only good rides that weekend from RBF! Reagan had her best dressage score yet on Heath, breaking into the thiries! Sarah rocked around the novice SJ and XC without jump penalties on Warren! And Megill had a beautiful XC round for her first time out for the season. She even got an unsolicited compliment from Becky Holder upon finishing. Unfortunately, she also forgot a fence on course and was eliminated. We're lucky she has such a good attitude. No matter she said. She was just happy that he was so great! Just about the time Reagan was to run XC the heavens opened. Elliot was very happy that he was done for the day as a river formed outside his stall. At that point, we all decided to pack it in. No one likes riding in the pouring rain. We like driving six hours home in wet clothes even less!